I’ve already written articles about getting the cheapest iPhone on O2, Orange and Tesco Mobile. But all these operators sell their iPhones locked to their individual networks. What if you want more freedom than that? What if you want to use two different SIMs, or simply want to switch to local network when you’re abroad? You could pay an eye-watering amount buying an officially unlocked one imported on the grey market from Play.com. The 16GB iPhone 3GS will cost you £715.99 (with free delivery!). Or, you could take your chances and buy an iPhone from eBay. I just watched an auction end for an unlocked iPhone; a 16GB 3GS went for £470 plus £6.99 postage – saving £239 on Play.com’s price. Not bad. However, the seller said he had “opened the box to unlock”, indicating that it’s probably unofficially unlocked using the iPhone Dev Team‘s fine work on their ultrasn0w unlocking software. So that means you’ll have to update your iPhone using a jailbreak tool and custom firmware everytime – or to put that jargon-free – no easy software updates from iTunes. So here’s an easier and cheaper option to buy an officially unlocked iPhone in the UK. Nope. Thanks to a tweet from Ross McManus, I found out that O2 have changed their policy on unlocking Pay As You Go iPhones. You now don’t have to wait 12 months to request an unlock – O2 will activate your iPhone for unlocking within 14 days. You’ll have to activate an O2 PAYG SIM with your new iPhone, and pay £15 to get it unlocked, but you can keep extra expenditure on top of the iPhone purchase cost to a minimum by following the instructions below. Buy £15 worth of top-up, and activate your PAYG SIM – BUT DON’T SPEND ANYTHING ON IT! Connect to iTunes and your iPhone will be unlocked! And that’s it! 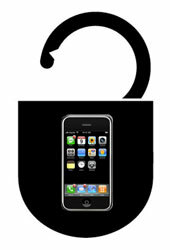 One unlocked iPhone, yours to use on any network! Technical side note: iPhone unlocking works differently to other phone unlocks. Apple holds a database of IMEIs of iPhones that are eligible to be unlocked. So: O2 requests Apple to add your IMEI to the database, sends you a text effectively confirming that they’ve done that, and then when you connect to iTunes, Apple activates the unlock. So the total cost is…? The only negative point is this – if you choose to unlock and continue using your O2 PAYG iPhone SIM, they will remove the bundled 12 months of unlimited Web and Wifi usage. But that’s not a problem if you’re planning on using an operator other than O2. Rather than buying an unofficially unlocked iPhone from an eBay seller, you can now buy one direct from an official provider, officially unlock (thereby enjoying easy software updates through iTunes), and use whichever mobile network you like. And, compared to paying for a grey market import from Play.com, you’ll save money! IMO until the networks (or Apple?) activate ALL of the iPhones functions as standard (VV etc) on unlocked iPhones then it just isn’t worth it. O2 have been unlocking since Orange started selling the iPhone. I agree that it’s a bit stupid that you have to be on an “iPhone tariff” to get certain features. VV has to enabled by the network though, but if you really want it you’ll have to pony up for an iPhone tariff or use something like Hullomail. great report matt! Thanks for taking the time to share the good and bad points..
the handset prices have all stayed static, their are no january sales for apple products, so i think its time to relieve o2 of another 16gb iphone..
On a contract with a 3GS but near the end so decided to un-lock. Filled form in on Sunday and got text message back on Monday afternoon telling me to insert new sim and sync with iTunes. Done and now able to use any service providers sim when my contract expires. Easy!! Wow that was quick! Have you decided on a new service provider? Yes, I was impressed with the speed! Maybe it was because I am a 16 month subscriber and they want me to be happy to stay with O2. I might just get myself a pay monthly sim and try another provider but haven’t decided yet! What about if you buy an iPhone from eBay. Can I still buy a Pay and Go sim, top it up to £15 and fill out a request? Is it that simple or is there a catch that I’m over looking? That won’t work, unless it’s an O2 iPhone. O2 will only unlock their own iPhones. But the iPhone is an O2 iPhone (it came with the O2 sim in it)?! As I said, if it’s an O2 iPhone, they will probably unlock it. I don’t know – give it a whirl. Yeah. Suppose I’ll just have to bite the bullet and see what happens. I read somewhere about needing to make a couple of calls, on the ‘Pay and Go’ SIM, which I suppose will get round the Security Question about Frequent Numbers! I’ll give it a go and let you know how it goes. Well that all depends on your network Chester. The cheapest way to do it is buy a PAYG SIM off eBay with 12 months of web n wifi on it. At the whole according to me Tesco is providing the cheapest prices for the iPhone deals. If one is not happy with that then best option is to stick with O2. Just wanted to say a big thank you Matt for the info on his website, and can confirm that this does work!! I bought a brand new O2 locked 16gb iPhone 3GS from eBay, bought a pay and go top up card with 20 quid credit, with unlimited texts & internet, and promptly filled in the unlock form on the O2 website. Waited 14 days, made some calls and amused myself by browsing the internet and downloading silly apps. After 14 days and no text from O2 I decided to re-submit the form anyway and then give customer care a call. After numerous calls (after being cut off several times, then having to redial and sit in a queue for 20 mins!!) I finally managed to find out that they had indeed taken the £15 from my credit and that they were escalating my case. The advisor added that I should receive a text in the next 4 working days. That evening I got a text saying “Sorry we cannot unlock your iPhone”. After spending 5 minutes being slightly miffed, I received two texts in a row saying that my iPhone was now successfully unlocked!! Weird but I’m happy! I’m now happily enjoying my iPhone on Vodafone for 20 quid a month rolling contract. My advice is to give O2 a ring if you don’t hear anything after 14 days. Happy days! Would this unlock now mean it can be used in other countries? Or is that just unlocking it for use with all networks in the UK? Unlocked means unlocked for use on any GSM network – in the UK and anywhere else. Will this work for the iphone 4? Hi, I live in France and have an iPhone 3G with Virgin Mobile here. I’d like to use the mobile when in the UK. (I’ve a PAYG number with Orange). What would you recommend please? Could I get the phone unlocked to use a UK sim? Thanks for any help. i brought mine off ebay. Called orange to unlock and a scum said it would cost £25, when i pointed out its £20 on their website, scum replied “oh alright its £20 then”. This is all well and good if you’ve already got an iPhone but what if you want to buy one unlocked!? Hi! I see that this was posted about three years ago. Does anyone know if this approach still works now? Thanks! I’ve just purchased an iphone 6 from Tesco, un known to me its locked to Tesco (haven’t tried a sim yet) I’d like to try EE Orange for the coverage at home. Any ideas? PS Tesco say they cant unlock until the manufacturer tells them they can. I spoke to apple they say its up to the carrier!